Dear Aidan As a Mancunian who has lived in the States for 30 years now, I truly appreciate your newsletter and especially the photo's. I am curious about one thing in your 29th issue, you say the Old Town Hall was cleaned up in the late 60's. Is this correct? 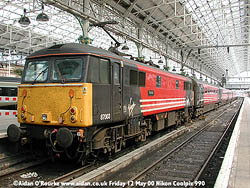 My failing memory tells me that on one of my infrequent visits to Manchester in the late 50's early 60's I seem to remember that the cleaning had taken place then and how everyone was surprised at the actual sand stone colour and not the thick black grime we all knew. Not trying to be picky and I'm sure you are right, just trying to test this 66 year old Mancunian's memory. Keep up the good work, yours is the first page I read when I get your E Mail. it brings back many fond memories. As an example you recently printed a picture of Alexandra Park. As a boy I lived in what was then Heywood Street Moss Side and spent many happy hours playing in the Park and fishing for "tiddlers" in the pond. I drove round the area in 1999 and was sad to see how dilapidated it has been allowed to become. In fact compared with the 30/40's the whole area appears to be run down. What a pity Moss Side and Whalley Range were ideal places to grow up in when I was a boy. Manchester's parks are in a very run-down condition - unlike parks in Harrogate, Chester, or Hyde Park London. Whalley Range is improving though, and Moss Side has shared something of the regeneration of Hulme. Hi there, as Mancunian who has lived in New Zealand for the past 40 years I just wish to express my thanks for the photo's and write-ups you are making available. I enjoy them very much. As I was born and bred in Didsbury - (I left in 1957) - I hope that you would consider a photo-shoot in that area also. I would love the opportunity to show my "Kiwi" family something of the place I lived in and loved those years ago. Many, many thanks for what you've done to date ! Ron Bridle. Very glad my pictures and writing are being appreciated on the other side of the world. 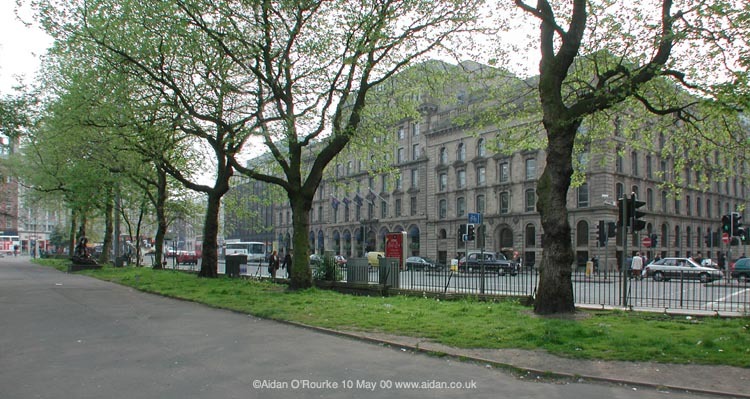 Dear Aidan, Although I live thousands of miles from Manchester, I was recently able to view the proposals for Piccadilly Gardens on the BBC website, as well as on your own. I must say that, on the whole, I think the ideas are good. The idea of what is essentially a large grass expanse with a pond/fountain (it's hard to tell) strikes me as nice and simple. The clusters of broad deciduous trees would seem to be an improvement and even the pavilion building (which I have yet to see a clear drawing of) might not be so bad - sometimes a controversial building by a renowned architect (in this case, Ando) is useful simply in terms of putting a city "on the architectural map". I do absolutely agree with you about the new building, however. It would be a shame to put a modern building - no matter how interesting on its own - in the proposed location. What bothers me the most is that it would block the view of the old hotel building (is it the Portland?) from the Gardens. Is this building going ahead for sure? 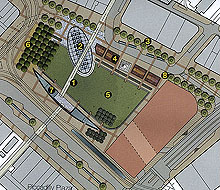 While I think the rest of the plan looks great, it would be very unfortunate to allow this new building to go up. It would be out of character and would block the lovely 19th century warehouse buildings. By the way, would it be possible for you to post some of the displays from the exhibit at town hall on your website? Living in North America, I can't exactly hop over and see them for myself. The City of Manachester local authority are resolved to implement their scheme, irrespective of the views of many people. A look in the guestbook of the exhibition indicates that there are quite a lot of people who have reservations about the building proposal. 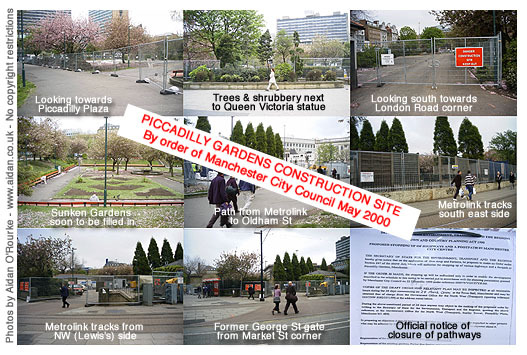 The reason why Manchester City Council will go ahead it is because they are short of cash and need to sell off the land in order to pay for their expensive redevelopment scheme on the rest of the Gardens. 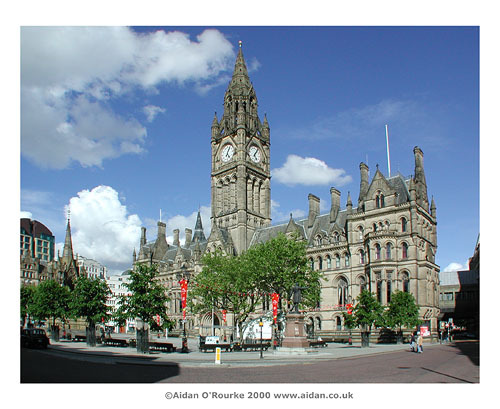 The public need to be better informed - the City Council should present their proposals on their website - It's not up to me to do their job for them, though in terms of presenting positive images of Manchester on the web, I've been doing it for the past three and a half years! English Heritage haven't put in any objection, the Civic Society have made their views known, Manchester City Council have given themselves approval for their own plan. What else can be done? I'm not sure. E-mail info (at) aidan.co.uk if anyone has any ideas. I noticed your photo in the Eyewitness in Manchester website. The locomotive is 87003 "Patriot" Its home depot is Willesden, north London, and was built in 1973.It has worked on the West Coast Main Line all its life. I stand corrected on the matter of insects, but I wonder if there are any countries in the world where they have a policy of washing the front of the train after every journey? - At least I wasn't too far off with the year of construction. I love trains but I'm not a train expert, so thanks very much indeed for your contribution. Firstly let me say that Piccadilly Gardens and the area around Piccadilly Gardens including Piccadilly Plaza need redeveloping. Secondly like yourself I was opposed to a building being built on the Portland Street side of the Gardens. Unfortunately it now seems inevitable that the building will be built. So on Friday I went to the Town Hall to see the 10 designs for the redevelopment of Piccadilly Gardens. After looking at all the designs closely and comparing them I chose design number 3 for the following reasons. Firstly when you walk into Piccadilly Gardens via London Road the building doesn't completely block off the rest of Gardens, unlike many of the other designs. There's a Plaza Square on the right hand side of the building which leads directly to the Gardens. You can also walk underneath the building directly to the Gardens. Secondly the building doesn't have a tower. A tower wouldn't match the surrounding building's, plus a tower would cast a shadow over the gardens. Thirdly the building is an attractive design and it complements the rest of the buildings around Piccadilly Gardens with it's size and structure. Overall I wasn't too impressed with many of the designs but at least the City Council have given us an opportunity to see the designs and comment on them. 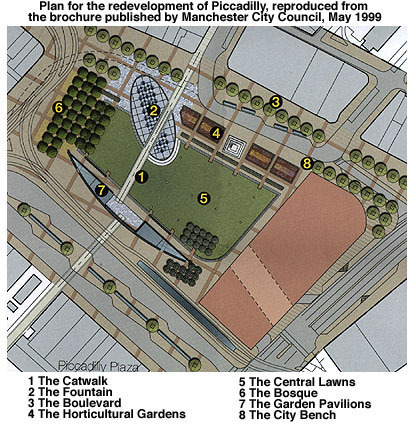 The one grievance I do have with the design for Piccadilly Gardens is the Visitors Centre opposite the Plaza. Firstly with the design, it looks like a shelter and secondly because the building completely blocks the Gardens from the Plaza and visa versa acting like a barrier to a continuous Gardens. I was wondering if you could add another category to your website? The category being buildings which need redeveloping or demolishing then redeveloping. A few example's are. The empty warehouse opposite the new G.Mex lock's development. The empty warehouse opposite the Malmaison Hotel on London road. The empty Post Office building behind the Malmaison Hotel. The empty building attached to the Ramada Hotel on Deansgate, opposite the new Cathedral Street development, etc, etc. The Curry House outside Piccadilly Train Station. Thanks for your contribution - Yes, it would be interesting to look at these forgotten buildings and feature them in a future Eyewitness in Manchester update. Has anyone got any further suggestions? As for the proposed building for Piccadilly Gardens, I didn't find any of the entries to be suitable, partly because they are all mediocre, and partly because this site shouldn't be built on. I have to admit I was very demoralised at just how bad the entries were. Still you should go just to see how bad they are!!! I've researched the post-war plans for local government reform e.g. the embryonic Greater Manchester County Council etc (which was far bigger than it actually ended up) and the incorporation of Manchester. This "Manchester and district" basically co-incides with the Manchester postal area and would be somewhere in the region of 1.3 million people now. I don't think anyone after war would have believed that 50 years on Manchester is still waiting to have all its districts incorporated. In 1974 Manchester was let down very badly with mickey mouse districts like Trafford, Tameside and the new Salford coming into being instead of a united Manchester. Note however that Manchester chamber and Manchester TEC cover these districts. Clearly because this is what Manchester actually is, how it works, plays even speaks etc. Manchester districts have already been hived off to other councils. E.g. 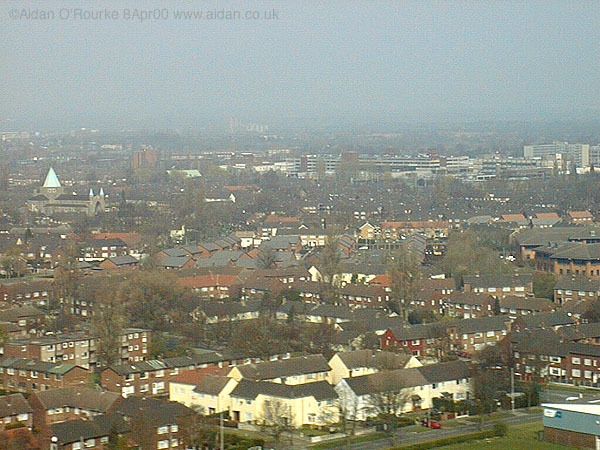 Prestwich in North Manchester which is forced to pay rates to Bury of all places. As I go to Prestwich most weeks I can assure you that Bury Metro has allowed this once proud North Manchester district to go to wrack and ruin. If these districts acknowledged they were Manchester districts and had an input into the governance of the city centre we might be getting somewhere, but these small-minded councillors are too interested in trying to pretend they're not Manchester. Look at the new Imperial War Museum at Trafford Park. Every commentator talked about Manchester's new museum etc. and the leader of Trafford council becomes furious because "it's not in Manchester". 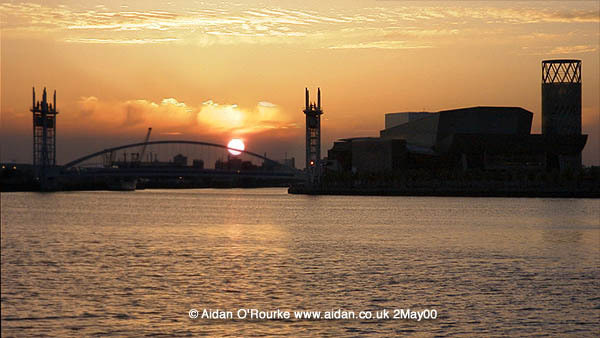 The Lowry, Salford Quays... Manchester?!? Same with the Lowry, a centre dedicated to a Mancunian artist (not my cup of tea but anyway), on the banks of the Manchester Ship Canal, in Manchester's docklands and councillors in Salford get upset because it's advertised as Salford Quays, Manchester. By cutting Manchester up in 1974 instead of uniting the city, the whole city (whether that is Stretford, Gorton, Prestwich or Salford) has been at a great disadvantage to smaller upstarts like Leeds and Birmingham. 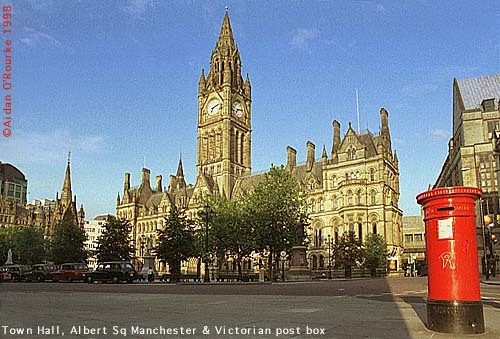 Manchester city council has petitioned the government for a unified Manchester, but it seems to no avail. I've written to John Prescott about the idea of one city council for planning, leisure, libraries etc. but five Manchester districts for education, housing, social services etc. but never even got a reply. That's why a body like the Manchester Civic Society needs to lobby for a solution to Manhester's local government disadvantages. I don't like the way the City council is so lax when it comes to developers. A city like Birmingham, which I don't have much time for normally, went over the plans for Brindley Place brick by brick. Basically Birmingham covers most of Birmingham. It was only in 1911 that even Aston Villa was incorporated into the city and Manchester should have done the same with central Manchester districts like Salford and Old Trafford. The point is that Birmingham has the luxury of the resources to have the muscle and time to insist on the new developments going the way they want them, even if that means no development at all. The bulk of Mancunians have no chance of influencing the city council, because the majority by 2 to 1 don't even come under the city boundary - and no other city in the UK suffers from this terrible handicap. The city council has governance over the largest office, finance and shopping centre outside London, but with very poor resources. It is far more interested in getting the investment than attending to details like a design to be proud of. A consultation process is pretty useless when all the options are fouth-rate and the land should never have been built on in the first-place. I feel sorry for the City Council - I too want to see Manchester wipe the floor with up-starts like Leeds. How is it to do that when the playing field is so stacked against it by it's non-sensical municipal boundaries? It intends to do it by agreeing to every development it is offered and the Manchester Civic Society is merely an irritant. Hopefully one day the councillors will see that good design = added value in the long term. While Manchester is still divided between mickey mouse districts like Trafford, Tameside, Salford I suspect the councillors will be too worried about not losing the investment to concern themselves (other than superficial consultations) with insisting on top quality architecture!! Manchester needs uniting and quickly! Maybe if the Manchester Civic Society put its weight behind the council's attempts for full incorporation, it would allow us more power and influence when considering schemes. Both want to see Manchester be the best, it's just that the city council are being a great deal more expedient and are blinkered to the harm they may be doing by accepting any old rubbish. I've just finished an MBA and having a deserved rest, but I'm thinking of trying to join one of the consulting panels in the autumn, being a bit of an architecture buff. I just hope I never see as poor a group of designs as I witnessed for Piccadilly on Thursday. I agree with most of what you've said. We should definitely be moving towards a bigger, better Manchester, but at the moment, hardly anyone even recognises there's a problem. 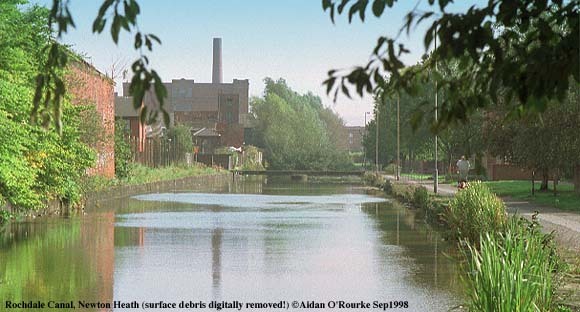 I'm not aware of a plan to restore the Rochdale Canal. It's currently silted up to a few inches below the surface. The Huddersfield Canal is currently being restored, thanks to millions of pounds of lottery funding. Maybe the Rochdale Canal will be given the same treatment. Dear Aidan, I am sure you get many personal requests but on the off chance that you are able to find something out for me, I am sending you some background info. Up until the early 50's (I believe) there was a Dairy in or near Ancoats. It's name was Brough & Wilds. I can't remember the street address but an old City Register would likely list it. I was curious whether or not the local area had been knocked down and rebuilt on. My Grandfather, Arthur George Sands was a Director of the firm for many years. He died in the late 1950's. He used to live at 2 Ingoldsby Avenue, Richmond Grove, Longsight. In the Longsight History Page, I was able to locate the house in one of the aerial photos. I have been led to believe that this particular area is no longer a desirable address. Also, his pub was the Shakespeare near Ardwick Green where, among other things, he was a lawn bowling expert. One of his many prizes, a barometer, now hangs on the wall above my computer. In 1938, I was sent to England by my parents to attend boarding school in Heaton Moor. 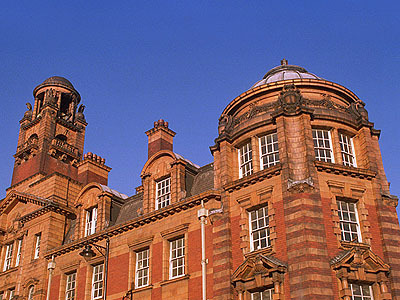 It was Heaton Moor College and I understand it has disappeared and a housing estate built up on the site. I attended this school from 1938 to 1943 when I joined the Royal Canadian Air Force and I used to live with my Grandparents during the school holidays. If you can find any evidence of the Dairy and/or any info about the Richmond Grove area, I'd be most appreciative. I enjoy the photos you publish. While the street names are somewhat familiar, the buildings have nearly all changed. Incidentally, I remember "hearing" a few shift changes in Ancoats when the workers wearing clogs walked to and from the local factories. It was quite a racket, I recall. I'm sorry, I don't know. It's all part of the 'lost Manchester' that most younger people nowadays have no interest in rediscovering. To find this information would take some time, looking in local records and registers and on maps. Unfortunately, I can't do this do to work commitments - Can anyone out there help? Thanks for your supportive comments. I enjoy publishing the pictures and reports! Hi, my name is Tony Marshall, but the majority of people used to know me as Anthony throughout my seventeen years growing up in my birth town. I used to live on Royley Crescent and when I left school in the summer of 1984, I briefly worked at the Elk Mill as a junior labourer. My family and friends have a history of cotton mill experience especially my late Grandmother and Grandad, Mary and Ellis. Mary had worked at the closeby Shiloh in her courting days with Ellis, who was doing his time in the army. On his return to civillian life after accomplishing many jobs, Ellis finished his working days at Her Majesty's Stationery Office in Chadderton and in conjunction was the acclaimed concertina player with the Royton Morris Men for many years playing such venues as the Royal Albert Hall. Mary died in January, 1986 and Ellis passed away in October, 1993. They had one daughter, Sheila, my Mum, who now lives in Feltham, Middlesex who hopes to achieve her dream of visiting Philadelphia, where distant relatives resided for some years. Me....Well, I left Royton early, 1986 with a view to seeing the big wide world...and that I did. I spent 12 years in the entertainment business, primarily as a Disc-Jockey, working Europe and most recently residing near Miami in South Florida for a short time. I now work in customer service/IT and I've lived near Hampden Park in Glasgow on and off for the passed decade. Thanks for sharing that with us! Amazing the memories a picture of an old building can stimulate. Buildings are definitely more than just bricks and mortarl. Elk Mill is now well and truly gone - in May 00 they've already started building on the site. What I think is that by the time I have my green card and am able to bring my wife to show her Manchester, I am going to need a map to find my way around. I lived in Manchester for 34 years and it seems it has changed more in the last 2 years than it has in the previous 30 years. I sympathise with you - Too much change can be traumatic - But after a massive terrorist bomb, the city had to be rebuilt. However, I think the original Manchester should have been reconstructed - the Victoria Buildings, the Shambles on it original location, and other buildings that were destroyed by 1960's redevelopment. Thank goodness there are streets in the city centre that have hardly changed at all, like St John's St (right). Thanks for your comments. Thanks so much for your email giving me the details on how to get that photo of Phillips Park Cemetery. I have now added this to my photo gallery of my family research. Just to say I really enjoy all your pictures in Eyewitness in Manchester, a lot of times it's like going down memory lane, or looking at how Manchester is changing. On the photos of flight path coming into Manchester Airport, the last one, showing Shadow Moss Road, the cream brick houses, right at the front of the photo, was actually a photo of my mother-in-law's house, the very end flat. It was such a surprise seeing this, and so there was another one for my collection. We've been in Aussie for 30 yrs now so you can understand just how much we love looking at all your photos of our old home town. Thanks again, and keep up the good work. Kind regards, Lynda Jones, Adelaide,South Australia, ex. Mancunian. Thank you very much indeed for your message - The things people here take for granted and often don't even notice are the things I like to photograph. A picture can mean so much, especially if you're far removed from the person or place in the photo! I am writing to you just to say thank you for your Eyewitness in Manchester and the pictures which go with it. I regularly have a look at the web site. I am a French person who lived in Liverpool three years ago and is a lover of England and the North West. I particularly enjoy your photos which I use as backgrounds on my computer at work . One month ago I had the opportunity to come back in the region and in Manchester and contemplate for "real" the views I can see on your web site. Eyewitness is also read by some of my friends who are part of the British community in Rouen. Both of them are Mancunians. It helps them to keep in touch with their city. Merci beaucoup de votre message. J'espère que vous continuerez à visiter Eyewitness in Manchester. S'il y a des endroits que vous voudriez voir, veuiller me renseigner. Saw your article about Ancoats. 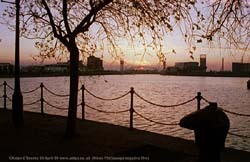 Never lived there - I come from Stretford. They are changing Manchester too much. I get there every few years, but I don't know way around any more. It is losing its charm - it does have some. Sorry about the mistakes, someone gave this machine and I am ttrying to fathom it out. It's a whole new world to an old geezer. Joe Rick 15 Lavender Lane, Levittown, Pennsylvania, 19054 USA. No problem, I've corrected your mistakes - You are right, they are changing Manchester too much, destroying its original character and substituting mostly a sterile, characterless and mediocre environment. Piccadilly Gardens is a good example. Very glad to hear from you and hope you'll return to Eyewitness in Manchester often. Thanks for your favourable comments. Try doing a search for "Salford buses" or "Lancashire buses". A local writer called Ted Gray specialises in this subject, do a search under his name too.